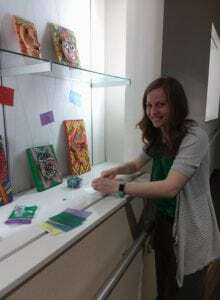 Keli Onken has helped set up many of the art galleries for the Tanager Place Traveling Art Show which showcases the art that kids make in their journeys through art therapy. The art show helps dispel stigma about mental health. This is what she has to say about volunteering with Tanager Place. I’m originally from Clinton, IA and came to Cedar Rapids to attend Coe College. I studied Art and Psychology. My husband, two kids, and I live in Cedar Rapids and enjoy watching the Hawkeyes, playing tennis and biking. I chose to volunteer with Tanager Place because I love their mission and what they have done for our community for years. They are helping families and kids and acting as a resource for families who need it. I help install the kids’ artwork throughout the community. We’ve showed work at the Public library, Matthew 25, and Raygun. I volunteer because it allows me to utilize my major from Coe, which is also my passion. I love how installing art galleries of the kids’ work allows me to interact with the community outside of my career. Each place we’ve installed galleries at has been somewhere I haven’t been before, with the exception of the library installation. I also love that I’m doing something that makes a difference. I think it’s important to get this work disbursed into the community so that people know these kids through their artwork and not just labels. This experience has opened my eyes to how great a community Cedar Rapids is and the great things that Tanager Place has been doing. I keep volunteering not because of my impact on the kids at Tanager Place but what their art shows me. They have hope in their work, especially as we take it out to the community for others’ to see it. I hope they know that their artwork is special and has spirit that goes beyond clay or paint or pencil. Are you ready to take your passion to the next level by giving back? Click here for volunteer opportunities with Tanager Place!